Team Fortress 2 was a pioneer, innovating numerous currently-hot trends like loot boxes, the hero shooter, and slick Pixar-style visuals, but the game’s star has faded even as imitators like Overwatch and Fortnite multiply like rabbits. But hey, just because Team Fortress 2 is no longer the hot new thing, doesn’t mean it’s lost its loyal fanbase. The game recently passed its 10th anniversary and to celebrate, Valve is releasing one of its biggest TF2 updates in years. The Jungle Inferno update relocates the action to more tropical climes, with a story shamelessly lifted from Jurassic Park. Mann Co. president Saxton Hale has opened Yeti Park, because sure, why not? Unfortunately, in a twist nobody could have seen coming, the yetis escape and start causing havoc. You can check out a new Jungle Inferno animated short, below. So far Valve has revealed a new map, the first one made in-house since 2015, and a couple yeti-related taunts. Here’s how Valve describes them. Mercenary Park – After a decade of dustbowls and gravel pits, it’s time to pack your snorkel, find your flip-flops, and endure a series of painful yellow fever vaccinations to your abdomen, because Team Fortress is heading to the tropics! Introducing Mercenary Park, a new jungle-themed disease-ridden three-control point map, made in-house by us! Yeti Punch – According to sacred Tibetan folklore, the noble Yeti inhabits the Himalayan region of Nepal. Now its stupid face can inhabit the knuckle sandwich region of your fist. Yeti Smash – Scare your enemies, impress your friends and trick sherpas into dating you with this Yeti transformation kit. Valve has also revealed five new fan-designed maps, and this is just the beginning. Valve is promising to unveil new Jungle Inferno content throughout the week — you can keep up with the latest updates here. Could we be getting more Valve-designed maps? Or, dare we hope, a new hero? 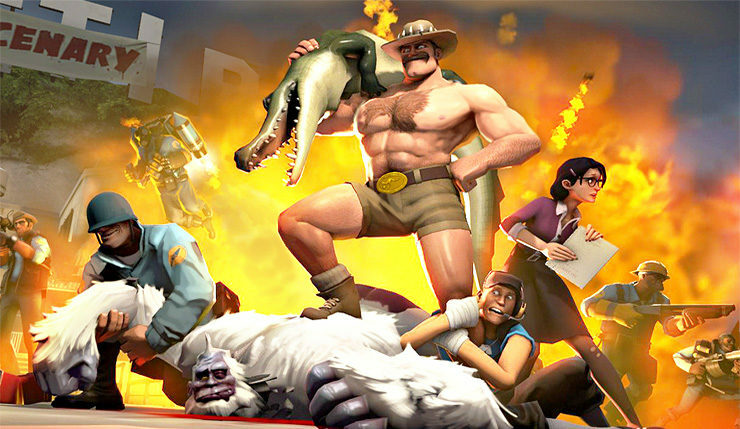 Excited to jump back in to Team Fortress 2? Or have you moved on to other things?